The Short Annapurna Base Camp Trek offers an excellent opportunity to experience the High Mountain and lowland village climate and culture. Due to the diversity in the region in terms of both, landscapes and ethnic group people are living in the region and along the trail. Some of these ethnic groups are Gurung, Magar, and Thakali. Bharal Adventure has researched thoroughly before creating this trekking holiday. Himalayan walking activity is definitely an intrepid act to do. Annapurna is a Sanskrit word for “goddess of harvest”. She is one of the most revered goddesses in Nepal. The massif also holds sacred connotations to Hindus in Nepal and adjoining areas. 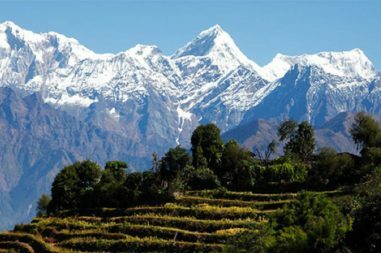 Short Annapurna Base Camp Trek offers this journey to the goddess of Mountains. This trek is one of the frequented treks in Nepal after Annapurna Base Camp Trek. Therefore, It is a tremendous opportunity to witness the breathtaking views of the Himalayas and sunrise. Definitely, that would remain alive in memories for years to come tempting you to come to return to the embrace of the Himalayas. The weather is stable with the clear blue sky. It is neither too hot nor too cold. Hence, the temperature is just outstanding. The average daily temperature for ABC in this season is 14-15 degrees at day and 5-8 degrees at night. As a result, the views are undisturbed, completely peaceful and clear. As this season will be full of trekkers, it is also safe for solo-trek. Even with some blue sky and sun, it is pretty cold with occasional snowfalls & storms, especially when you reach higher altitudes. December is normally dry, stable, and clear so this month could be a preferable choice. The average daily temperature for ABC in this season is 8-12 degrees at day and less than 2 degrees at night. In this season along with the stunning views, you will find nature & its ecosystem unique and mesmerizing. The blooming rhododendrons, the green hillsides turning into white, pink, and red colors could be observed. In March/April, the surrounding is colorfully beautiful. Weather is sunny and warm with outstanding views. Though it will be dry and dusty, but not as many would think. The average daily temperature for ABC at this time is 15-18 degrees at day and 7-8 degrees at night. Though some days may be cloudy as it is pre-monsoon season. Especially, Crystal clear view of unique ecosystem all around. The colorfulness of many blooming flowers in upper hills and trekking paths could be observed. 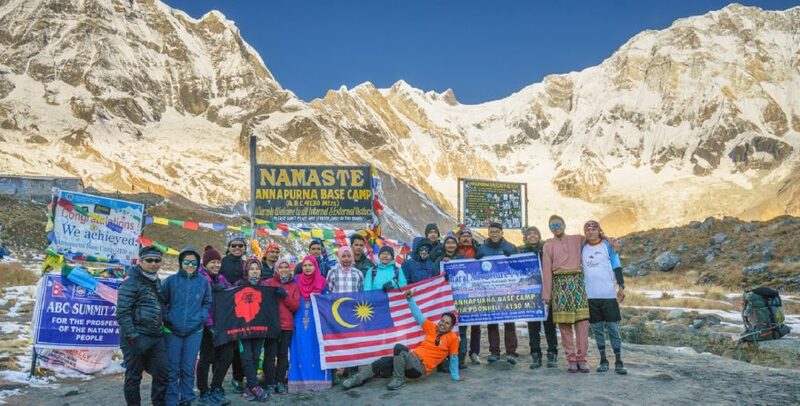 During our Annapurna Base Camp Short Trek, we can enjoy authentic Nepalese food as well the more common international cuisine (Tibetan, Continental, Italian, Indian, etc.). Breakfast and dinner will be served from the tea-houses or from a lodge menu where we spend the night whereas lunch will be served on the way to the next destination. All meals will be provided during trekking while only breakfast will be available while in Kathmandu and Pokhara. There will also be welcome and farewell dinners for guests. 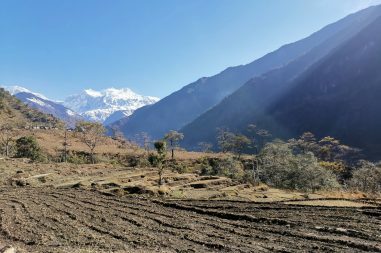 The Annapurna Region is stunningly beautiful, but equally fragile. Future generations have just as much of a right to appreciate it as we do and so the tourism industry has an obligation to protect and preserve it. Bharal Adventure employs a 'zero impact' policy on the natural environment and the traditional communities that live there. Himalayan Glacier, therefore, enforces a number of do's and don'ts. Himalayan Glacier's experienced staff can advise us on how to minimize our impact on the local environment. To find out more about the clean-up campaigns and environmental awareness events, Bharal Adventure works with KEEP. All of Bharal Adventure’s treks are planned with high degree of awareness of AMS (Acute Mountain Sickness). Going up at higher altitude too fast causes a medical condition serious enough to kill. We understand that for a safe trek, it is essential to allow sufficient time for acclimatization. Sensible planning is therefore required to minimize the risk of AMS. 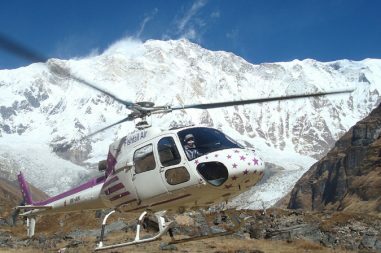 Himalayan Glacier's itineraries are designed to prevent AMS as much as possible. But, it is important to remember that some visitors are more vulnerable than others. Today you will have a scenic drive to Nayapul for about one and half hour as you will be preparing for your trek to Chomrong for about 7-8 hours. You will be amazed to observe the beautiful himalayan ranges of Nepal. From here, the trail goes down to the Chhomrong Khola from where ascend begin up to Khuldighar at 2,380m which accommodates an ACAP Check Post. Hereby begins the climb towards Dovan where we will be staying for the night. This day we will start our 4 hours trek to Machhapuchare Base Camp. We will be able to observe the amazingly beautiful Annapurna Sancturary and then hike through glorious route. We will reach Hinko Cave which is one of the main attractions of the destination. 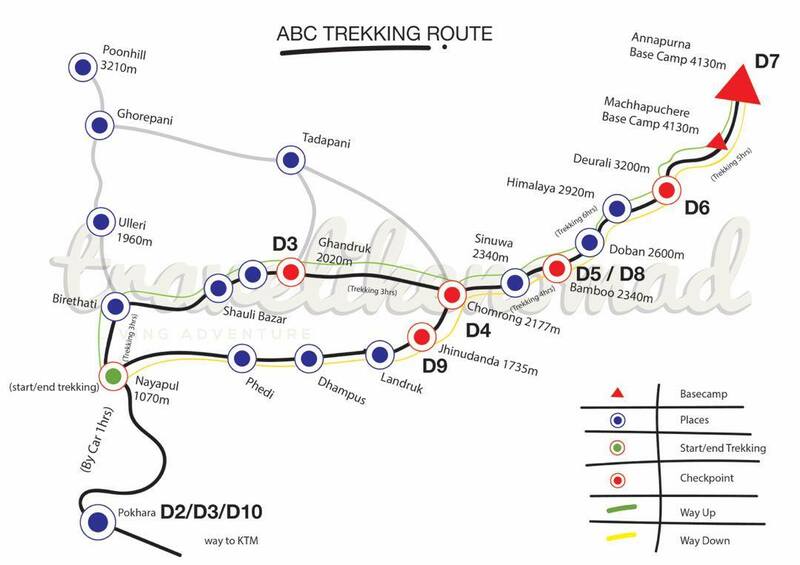 Then we will head towards ddeurali which will direct us to our destination Machhapuchare Base Camp. We will be exploring the most efficient part of the journey Annapurna Base Camp today early in the morning. We will be able to explore the mesmerizing sunrise view from the Base Camp. The magnificient scenery will leave you speechless. Then, from here, we will be retracing our trail of the day before as we descend down to Bamboo. The trail drops by 1,700m to the bank of Modi Khola on the way to Bamboo where few teahouses and lodges are available for overnight stay. Today as we pass Khuldighar, we will move towards experimental sheep farm tracing the trail through rhododendron and bamboo forests that descends to Jhinu hot spring where we will relieve all the stress and exhaustion of the journey. The bath at natural hot spring in Jhinu is the best way to beat the anxiety of the expedition. Following the trail along the right side of Modi Khola for five hours from Jhinu, we will arrive at Birethanti. This walk is one of the most relaxing of the entire trek. From here, twenty minutes walk will take us back to Naya Pul from where we drive for an hour to get back to Pokhara. A scenic drive from Pokhara will bring the team back to Kathmandu where the evening is spend either relaxing or shopping for souvenirs.